The fabulous Anne is back with another show stopper! 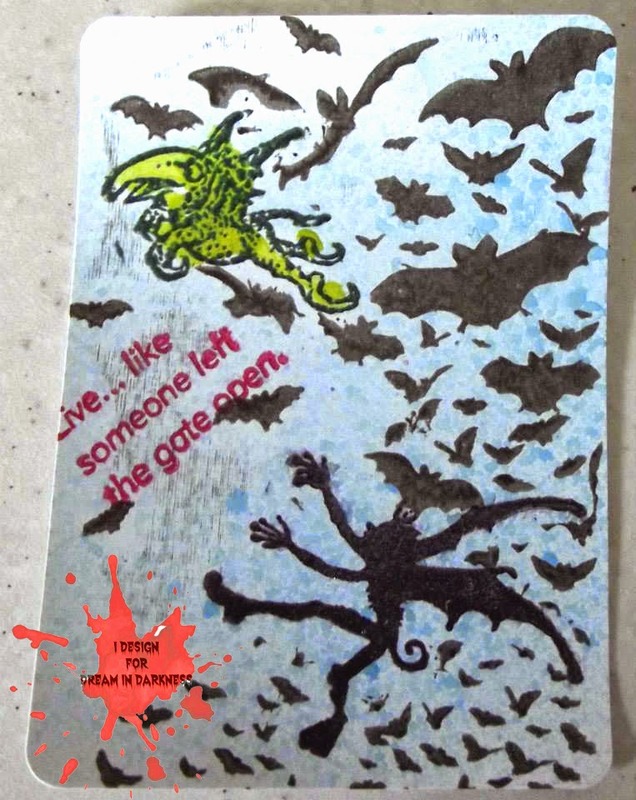 These bats are flying away from something.....and the sentiment suggests why they are fleeing! Here are Anne's words on this marvelous ATC"
We thought this would be an appropriate thought to leave you with today! The gates ARE opening SOON here at Dream in Darkness Challenge! It's "Anything Goes" as long as it goes dark! We have lots for you to read here on the blog that has been posted so far! Save the date, the gate will open May 1st and keep visiting us as we get the bat cave..uh oh I mean house ready! More goodies coming your way leading up to the 1st and we are so excited to have visitors! Tell your dark side friends and then get convert your cute side friends to create something for the very first challenge of Dream in Darkness! Fabulous love all the bats. Sorry for not having words added sooner "Creator". I am heading to the naughty corner as I type...sob! You made it work brilliantly! ! !